The Croad Langshan was imported into this country from north China by a Major Croad in 1870 and the Croad Langshan Club was formed in 1904. They are dual-purpose birds, slightly smaller than the Brahma and the Cochin. 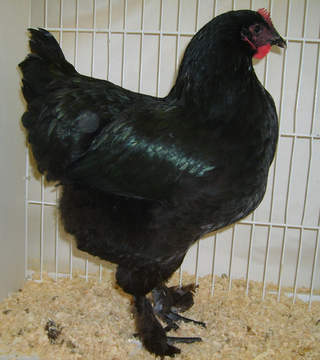 The breed is similar to the Black Cochin and when first introduced, it was actually classed as a Black Cochin and supporters of the breed spent the next 35 years proving that it was a separate breed. They are a heavy breed yet possess grace and they have a definite U-shaped appearance from the side because the tail is at the same level as the head. The beak tends to have a lighter tip and the eyes are brown. The comb, wattles and earlobes are all bright red and the legs are slate grey and feathered. The male has very long tail sickles and a well spread tail. The breast is deep and the legs short so they make excellent table birds while the hens possess a deep abdomen and produce a good number of eggs. Brown shelled eggs were a rarity in England until the Croad Langshan was introduced, as it was the first Asiatic breed in this country to produce them. There is a bantam version. They are strong, intelligent and active birds and chicks mature fast. The hens are excellent sitters as they are large enough to cover a dozen eggs at a time and make wonderfully attentive mothers. 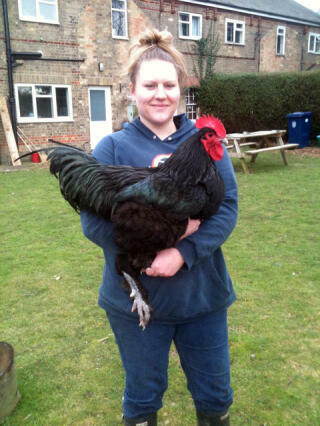 They are heavy birds so don’t fly much but are able to get over low fences so boundaries need to be secure. Care also needs to be taken as their feathered legs and feet can get matted and dirty in wet conditions so a dry environment is preferred. They are docile, quiet and tolerant birds which are friendly and easily tamed and so are an excellent choice for families. They are also long-lived birds. Cockerels weigh around 9lbs while the females are 7lbs. 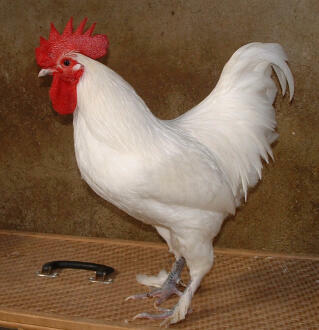 The bantam version weighs 1lb 7oz for a hen and 1lb 11oz for a cockerel. The original version has black feathers with green beetling but there is also a White and a Blue Langshans. Please note: All chickens listed here are for collection only. They cannot be delivered by the seller or by Omlet. The seller will send you their contact details to arrange payment and collection. I got 5 blue Langshan from Tractor Supply. 2 roosters and 3 hens. They are awesome. Laying now. Huge eggs. I ordered an incubator . I want to promote and help promote the breed in Kansas. My White Croad Langshan is laying purple eggs!! They are unlike anything I have seen. She came from a hatchery in Ohio. 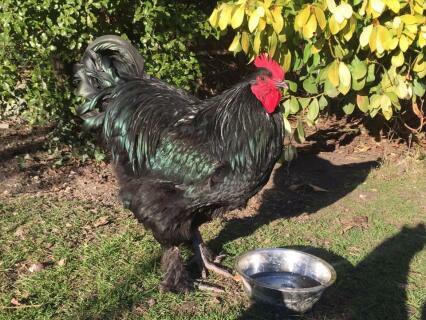 Looking for the Cockral to breed my own. 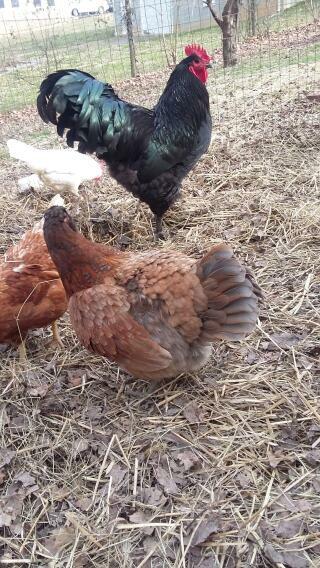 I have seen some lay plum colored eggs and some laying brown eggs. Mine are lilac/purple colored. 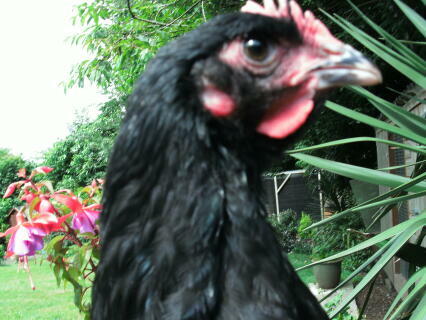 My hen is one of the best hens I have ever owned in 43yrs. I have three of these birds in my flock. 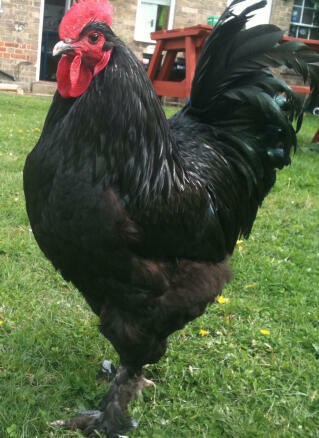 There are Buff Orps, Red Stars, Australorps and recently added young Jersey Giants. 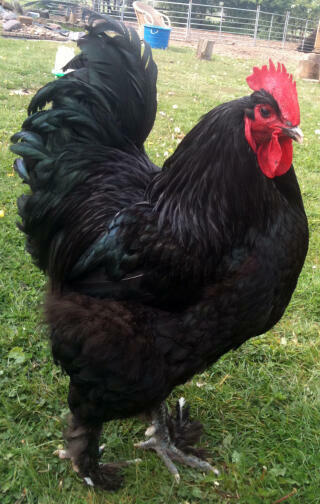 The Langshans are unique in that they are top of the pecking order but not mean to the other chickens. Like if a Red Star exerts dominance over a buff it will chase that chicken across the pen and throw in an extra peck for good measure. The Langshans will sometimes peck at any other chicken that is competing for some food it wants but never in a mean way. Just a peck to make the other chicken get in line then goes about its business. This to me is an important distinction and reflects the good quality of the bird. It is also the only hens I have ever seen face off against one another in a lengthy stare down where they stand really tall and look each other right in the eye like a dare and can be slightly scary when they do this (only seen it once) They can fly to the top of a four foot fence with no problem only a few of the buff orps can do this and none of the other breeds are this flight capable that I have seen. For very tall large heavy LF birds the ability to just jump and flap their wings to four foot height is impressive in my opinion. Demonstrates the power and overall athletic agility of the breed.